The following pages are dedicated to all the men of Beckingham and Saundby who served, were killed or were injured during the first and second World War. Included is the history of sites within the two villages that were specifically used for war/training purposes. The Weeping Angel sculpture stands in the Notre Dame Cathedral in Amiens, Northern France and was created by Nicholas Blasset (1600-1659) as a funerary monument to stand above the tomb of Canon Lucas of Amiens. Blasset's home town was also Amiens and he created many other sculptures for the interior of the cathedral. The sculpture became a symbol of all that befell the people of the Somme Battlefield of the First World War and soldiers during that period would send postcards home to their families. This was possibly because of its sentimentality and the symbolism of the monument, which was highly appropriate for the times. 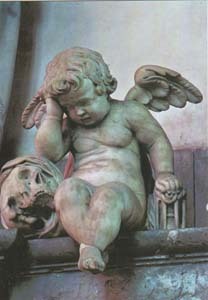 In Christian symbolism, the weeping angel represents grief, or mourning for an untimely death. The skull, represents mortality. The hourglass also represents mortality, and the swiftness of time. Because the hourglass must be turned upside down for the sand to run out, it also represents the cycle of life and death. The Weeping Angel still has the power to move people today and stands behind the main altar of the cathedral.